So, I went into a store today to exchange some pants that were too big for Charlie. We were on our way to a Halloween party. Let me say that again: a HALLOWEEN party…and they had Christmas music playing in the store. I am already excited for Christmas this year, but I do want to enjoy Halloween and Thanksgiving first. I’m really trying not to rush it, so I would appreciate it if the stores would hold off a few more weeks on the Christmas music! I was looking back through the drafts of things I have written, and found this from last December. It was a good reminder to me of what I want not just Christmas to be like, but every season and really every day. This time of year, I have to be careful. It is so easy for me, with my type-A-just-get-it-done personality, to zip through the season without enjoying a minute of it. Before I know it Christmas is over, the house is left feeling empty without the tree and the lights, and it’s somehow January. I have to intentionally enjoy Christmas. This year, I’m doing a few things differently than in the past. First of all, I am not stressing about our decorations. It was SUCH a pleasure to decorate our tree this year, because Maddie (whose servant-heart is coming out more and more each day) decorated it. She unwrapped each ornament, showed it to me and asked where it came from, then hung it on the tree. I did move some of the breakable ones from their precarious positions, but other than that I just enjoyed her help. After staring at the decorated tree for awhile, I decided that our tree, its bottom branches hanging heavily with ornaments, is perfect. The memory of her decorating it is one I will hang onto for awhile. On the table where I usually put my Christmas Village sits Martin’s house that the kids made out of Lego Duplos. Martin is our elf, and he loves his house. Normally, I would not allow a giant Lego house to sit out for weeks, but I am letting it go because it is such a hoot to see the kids run to the house every morning to check for Martin. He’s not always there, but it’s the first place they look. I am also making an effort to turn my obligations into opportunities. This sounds so cliche, but it’s been important to me this year. I found myself stressed out about the holiday get-togethers, the food for the parties, the presents. I felt like I was going to the grocery store every day, spending too much money for no reason. Then, a friend of mine on Instagram posted a picture of her full shopping cart, saying she was buying for a baby shower, a Sunday School party, a women’s ministry meeting, and more. I thought, “Ugh! Poor girl!” But reading on, I saw that she was so happy to have that shopping cart full of items. She felt blessed to have those opportunities to minister to people. And what happened, then? Well, in Whoville they say – that the Grinch’s small heart grew three sizes that day. And then – the true meaning of Christmas came through, and the Grinch found the strength of ten Grinches, plus two! Now, when I have to run in the store one more time or buy one more present for something, I see them as chances to spread a little of Jesus’ love. The entire reason for this season is to celebrate Jesus’ birth, and if I don’t take every opportunity to show his love to people, I am missing out. Isn’t Christmas such a dichotomy? It’s a time of joy and giving and getting and celebration, but also a time that I am reminded of the brokenness of this world. As a child I was split between parents, and even as a married adult this brokenness continued as Jason (who is also split between parents) and I traveled from Christmas to Christmas to Christmas to Christmas. Even though we were having a great time and spending time with people that we love and who love us back very much, it was also stressful and just…hard. We spent a lot of time away from our home and on the road for our first Christmases as a married couple. There has been so much joy found in Christmas since C and M were born. We have new traditions like cutting down our tree at the Doby Christmas Tree Farm every year, and watching “The Polar Express” with hot chocolate and cookies. We start listening to Christmas music in November and wear tacky Christmas shirts every day. The kids wake up every morning to find our elf, Martin (On a side note, I’ll be honest and say that I’m not too sorry that he’s gone back to the North Pole for the year!). Their innocence and excitement is contagious. This Christmas also brought with it a new aspect for me: grief. It was our first Christmas since losing Kitten (my stepdad) and I missed him and his huge presence. I also really mourned my grandma, who passed away 3 years ago on the day after Christmas. Recognizing this dichotomy makes me really want to soak in every good moment that Christmas offers. One thing that was so special about this Christmas was that, since it fell on a Sunday, we got to go to church. It was a privilege and a pleasure to join my church family on Christmas morning and worship with them! Focusing on the real reason for Christmas makes the good and bad aspects of the season easier to bear, because both can be a little overwhelming. As I go through this life, the good and bad become more evident, but Christmas reminds me that Jesus left his Heavenly home and came here to fulfill all of the prophecies that spoke of him so we could dwell in the light, not the darkness. We’ll have brokenness and grief and the stress of getting our families dressed for church on Christmas morning, but there is also peace and joy and love and celebration. These things go hand-in-hand (for now). What a blessing to have that comfort and to celebrate Christmas with Jesus at the center, to feel the grief that is simply part of life, but to accept the peace that the Holy Spirit brings only because Jesus walked this Earth. Christmas is all of the feelings concentrated into a couple of days, with wonderful promises of what is to come. One of my favorite things about Christmas is that for several days after, the kids are busy, busy, busy with their new toys. They don’t say my name unless they are hungry or thirsty or need help changing costumes (or if they get bitten by their new hamster), and I am left to my own devices around the house. I spent yesterday afternoon taking down most of our Christmas decorations and thinking about what a wonderful Christmas we had this year. We made some really great memories. 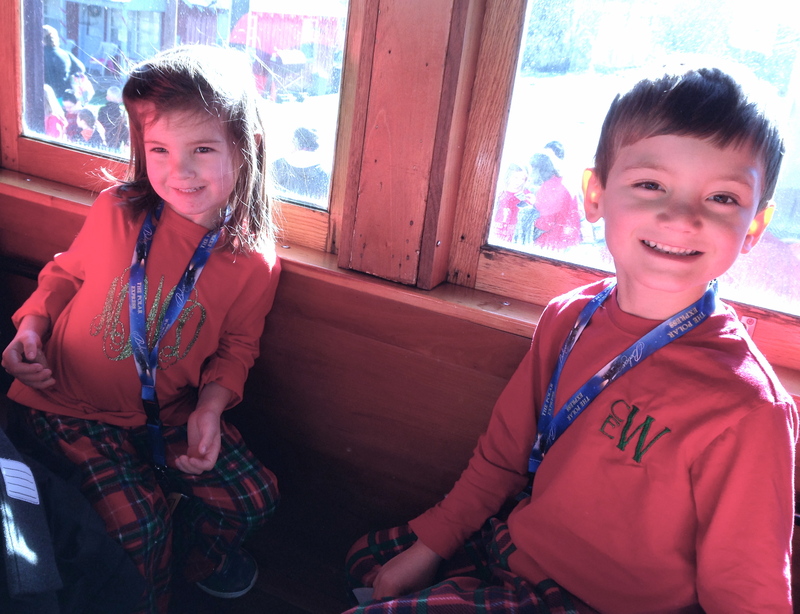 A week after Thanksgiving we went to Bryson City with some friends to ride on The Polar Express. It was a surprise to the kids, and it was nothing short of magical. Charlie thought I was crazy when I told him that he could wear his pajamas all day! 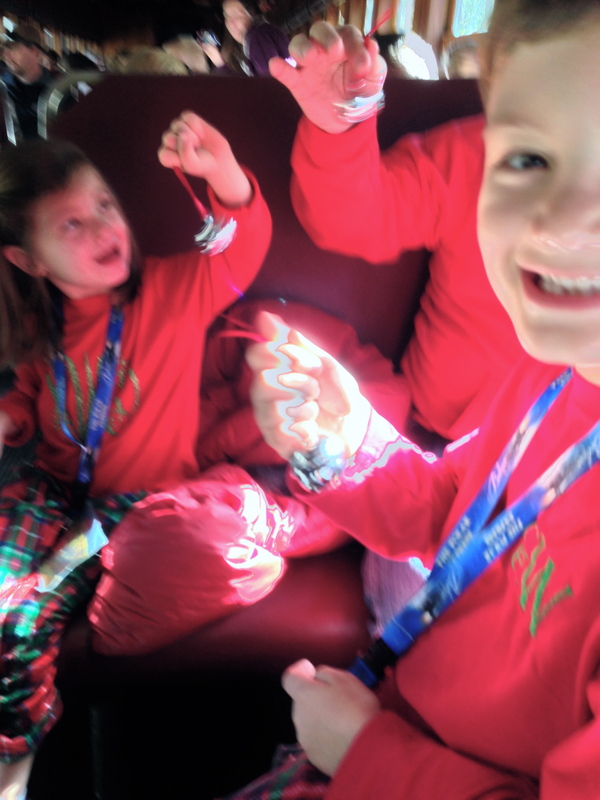 This is after Santa handed out the bells, and Charlie turned around and asked, “Can you hear it, Mama?” I’m pretty sure I could only nod for fear of bursting into tears. This was the perfect way to start out December. We didn’t feel pressured to take the kids to see Santa or anything like that, because how can you top riding the Polar Express to the North Pole? This will be a really special memory for all of us. Another memory I will always keep close to my heart is that of Maddie helping me decorate the Christmas tree. She is developing such a sweet servant’s spirit, and she put most of the ornaments on our tree this year. She unwrapped every ornament so carefully, then asked me why it was special to me before she hung it on the tree (mostly on the same branch:)). We did end up with a small pile that had to be super-glued, but that is totally worth the image of her working so hard to get our home ready for Christmas. We got to spend special time with all of our different families (which we have an abnormal amount of, but that’s a different post). I don’t have too many pictures since our camera is still broken (Jason and I are playing a little game where we each carry the camera around in our car for awhile and act like we’re going to take it to get it fixed), but took some pictures with my phone. Charlie, Maddie, and Emma with Macy on her 1st Christmas. 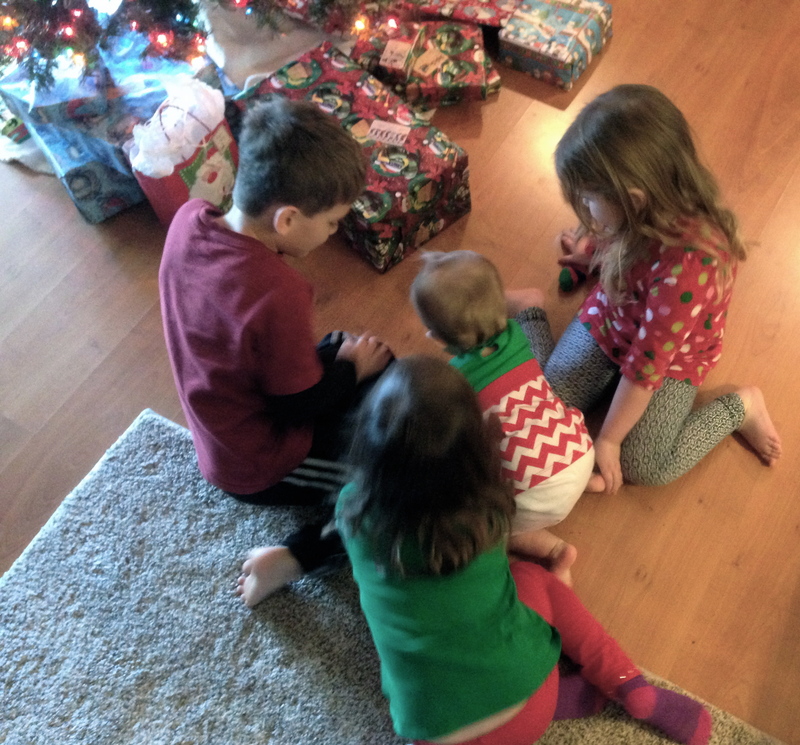 They were “patiently” waiting to open presents and teaching her about what was about to happen! Star Wars was definitely the theme this year! Actually, I think that not having a camera helped make this Christmas even better. Without the need to lug that heavy thing everywhere we went then spend all of my time looking through the camera lens, I had time to enjoy everything first-hand. -Finish sending Christmas cards. For some reason, I NEVER order enough Christmas cards. Then I end up paying too much money to get more cards and rushing around to get them in the mail. This year, when I ran out of cards I just said, “That’s it.” So if you happen to have a last name that would be at the end of my address book, I’m sorry. I’ll start at the end next year. -Buy tons of presents. Actually, Jason did most of our shopping this year. He had a great time going to different stores and buying things for the kids, and I think it made Christmas a little more special for him. I know it did for me! -Have perfect decorations. Our Christmas decorations were very pretty, but “child-friendly”. Our advent tree ornaments were our kitchen table centerpiece, and instead of my Department 56 “Christmas in the City” village we had a huge Lego-house built for Martin, our Elf on the Shelf. And like I said, our Christmas tree may have been a little one-sided. I did, however, feel the need to finish our Advent Jesse Tree this year. Last year we only made it about halfway through, but we spent time each day on it and learned so much. It was a great experience to learn with the kids and teach them about the prophecies leading up to Jesus’ birth, about sin entering our world and God’s perfect solution for that. We truly celebrated Jesus’ birthday this year, and that is what really made the difference in our Christmas. So our decorations are (almost all) put away and my vacuum-cleaner bag is full of glitter and pine shavings. We’re enjoying the lull between Christmas and New Years, a few days where things seem to move slowly and we take naps and clean house and spend hours (no joke) playing with Play-Doh. The saga with our Christmas tree continues. We have redecorated it for New Years and hung on to it as long as I can stand it. When I told Charlie yesterday that it was going outside, he started to protest, until I told him we were turning it into a home for the birds and squirrels. I’m not sure what people who live in a city do with their trees, but here we have tons of options. We can throw them in the woods, tie a weight of some sort on them and throw them into a pond to make a little home for the fish, or just set them on fire. We even have a nearby tiger refuge that accepts the trees as donations. Apparently, the tigers love to play with them. After talking with my mom and mother-in-law, I learned that my latest idea wasn’t a new one, but I still think it’s pretty cute. It satisfied Charlie’s need to keep our tree forever, and it will give us something to do for the rest of the winter. 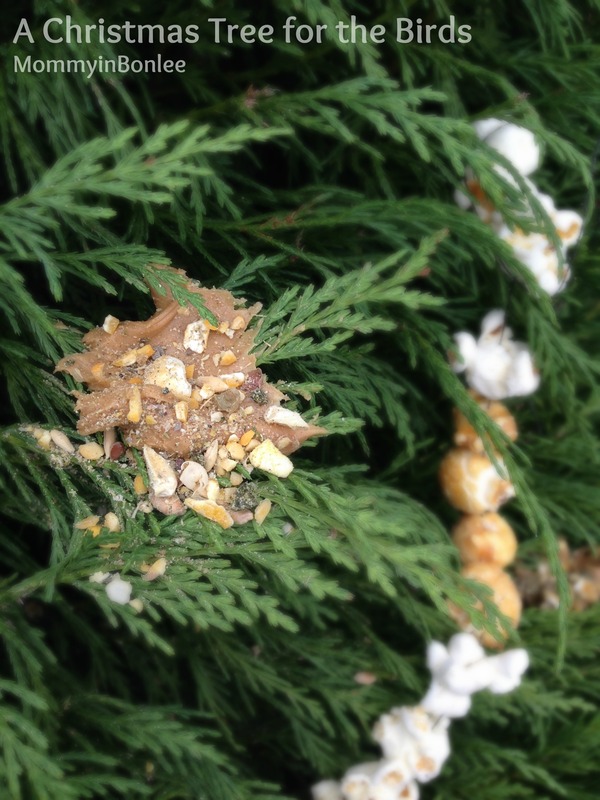 To make our Christmas Tree for the Birds, we strung popcorn (leftover from our Christmas popcorn tin) into garland. We hung it on the tree (which Jason stood up on the fence in front of our house), then smeared globs of peanut butter onto the branches. The kids pressed more popcorn and bird food into the peanut butter. We look forward to keeping our tree stocked with goodies for the animals that populate the woods, and to watching them from our front door! 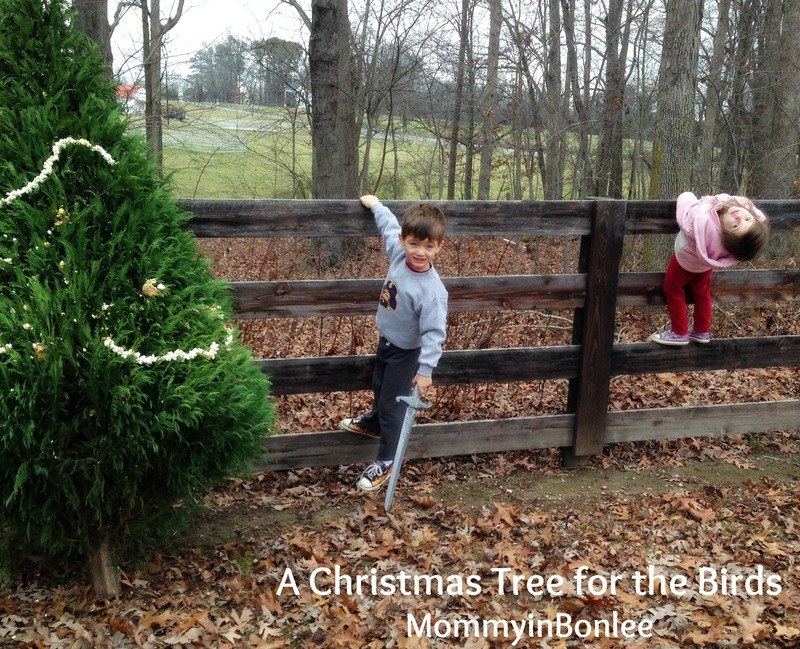 What do you do with your Christmas tree? So, here we are. Halloween, Thanksgiving, and Christmas are over. They flew by, didn’t they? I wish I had tons of pictures to share with you, but we were grossly inadequate on the documentation front this year. We videoed the Christmas play at church, then couldn’t quite get it together to record much more. I couldn’t bring myself to spend time clearing off memory sticks and recharging batteries. Our camera has been behaving badly, so we didn’t take many pictures, either. Over the last couple of years, as children have been added to our families and we have lost our grandmothers, our Christmas traditions have gone through some changes. While it is sad to let go of some traditions that we have had throughout our childhoods, it is also exciting to begin new things within our little family. This Christmas Eve we opened up a Christmas Eve box here at the house. Inside were matching PJ’s for the kids, Jason, and me, along with a tin of popcorn. We put on our new jammies (thankfully the camera wasn’t working! :)) and ate popcorn while watching How The Grinch Stole Christmas. It was a fun way to spend the night. Since this Christmas (and the entire Holiday season) has been so great for us, I am trying to take the next few days slowly. Usually I put up all of the decorations on December 26, ready to get the house cleaned up and uncluttered. I am a lover of a new year and the feelings of starting over with the clean slate that it brings, so it has never been a problem for me to rush Christmas on so I can get started on new things. 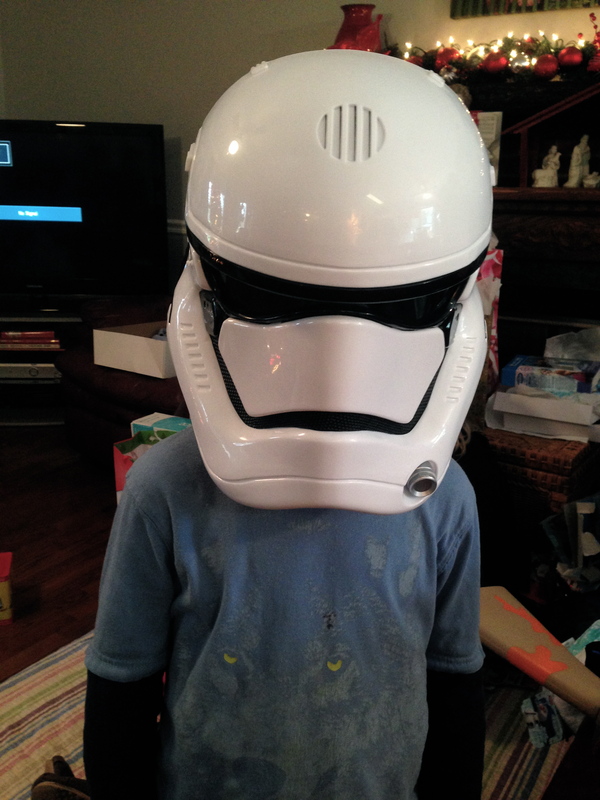 Last year, however, Charlie dealt with a little sadness after Christmas. He was disappointed that it was over and protested when I did my usual December 26th cleansing. I regretted rushing the season on. This year I have done things differently, not just for Charlie, but for me. I found myself experiencing a little sadness when I began taking our decorations down, so I decided to take it very slowly to make it a little easier on us all. The kids and I have been taking down just a thing or two every day, in between time spent playing their new board games or watching new movies. They have spent days in costumes, playing with their new toys. Today, we turned our Christmas tree into a New Year’s Tree. Isn’t it gorgeous? We took off the Christmas ornaments and the colored lights, then added these beautiful large white lights and put some silver sprigs and ribbons at the top. It’s simple and pretty, and when we’re ready to take the tree out (probably over the weekend) it won’t take long to take the decorations off. 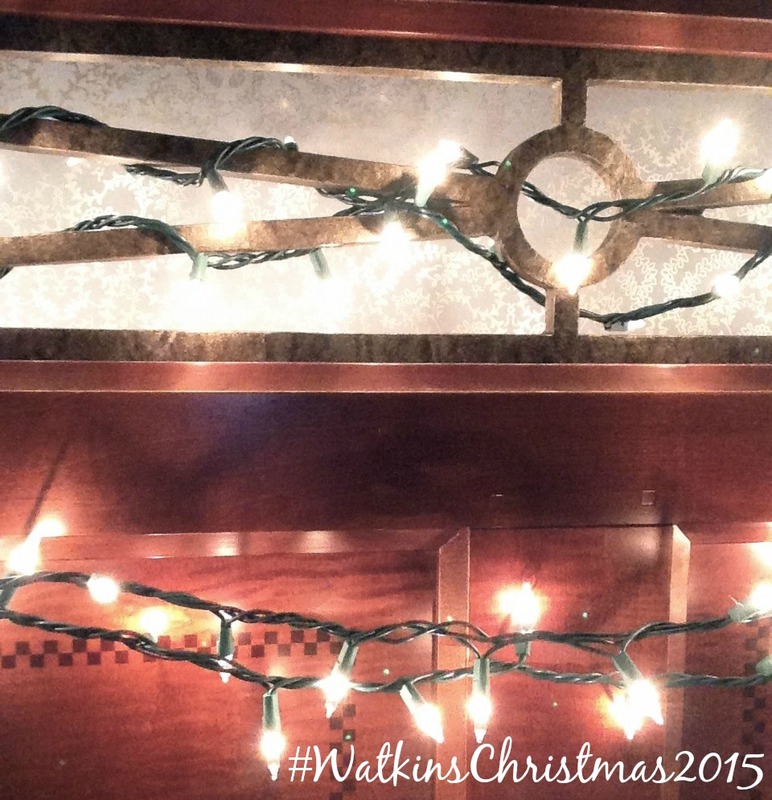 We all love it, and we can enjoy the warm glow of Christmas lights a little longer. Another thing I have been doing to try to draw out the Christmas cheer is discuss the idea of giving all year long with Charlie and Maddie. John 3:16 teaches us “For God so loved the world that he gave his only begotten son, that whosoever believes in Him wouldn’t perish, but would have eternal life.” This is the Christmas message, and one we are going to try to emphasize this year. Proverbs 3:27 says, “Do not withhold good from those to whom it is due, when it is in your power to do it.” God gave us the greatest gift when He gave us his Son, and we should spread that message of giving when we are given the opportunity. When we do this, the spirit of Christmas will last the entire year through. 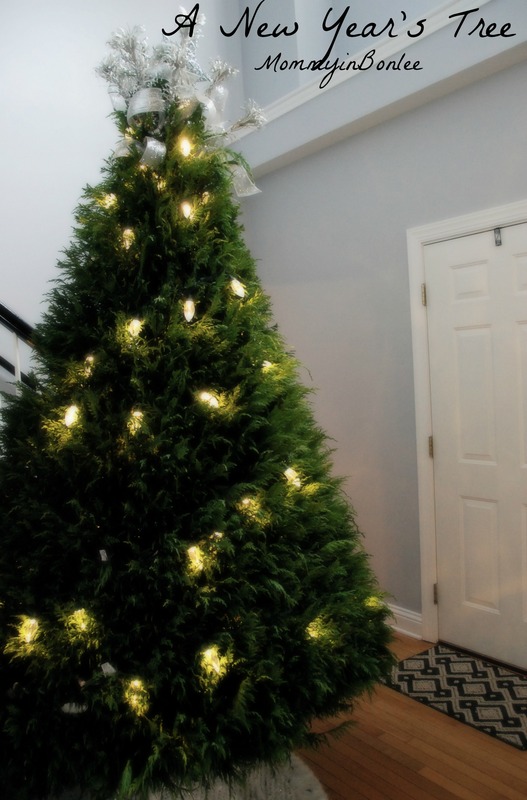 How do you keep the Christmas spirit alive in your home?